I’m going to talk about two places in the U.S., both of which I will not necessarily assume that you’ve heard of. These places are Tybee Island, in Georgia, and Chandler, in Arizona. Alone, these places have little meaning to most people. But if you’re part of the WordPress community, you’ll want to keep them in mind. They played host to WordPress Community Summit 2012, PressNomics 2012, and Team ManageWP for the past few weeks. A few of us at Team ManageWP — Vladimir Prelovac, Adam Warner, and yours truly — arrived back home about a week ago from Tybee Island. Tybee, itself, isn’t a place you would hear about in travel brochures and magazines. But two weeks ago Tybee had a crucial role within the WordPress community: hosting the inaugural WordPress Community Summit 2012. This event represented the first official in-person and invite-only gathering of WordPress leaders and innovators from around the world. Imagine around 100 of the WordPress community’s most active and prolific community leaders taking over an island. How awesome of an idea is that? This was some of what hurricane Sandy was sending our way. Thankfully, we managed to avoid most of Hurricane Sandy, but our friends in the Northeast were not so fortunate. Our best wishes go out to all those affected. 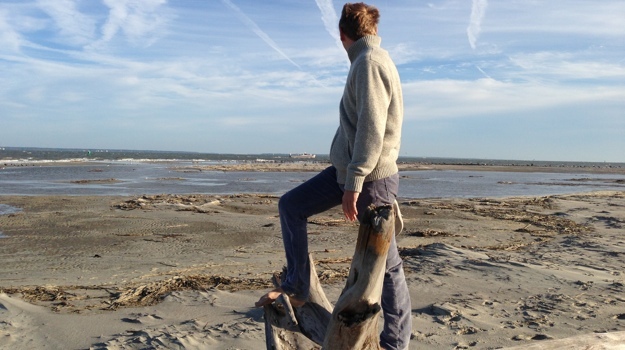 Vladimir’s observing the beautiful Atlantic ocean on the north-end of Tybee Island while standing atop of our self-declared “Thinking Log.” That got us thinking: we need a thinking log for our offices! Arranging a beautiful ocean view, however, might be a bit more of a challenge. 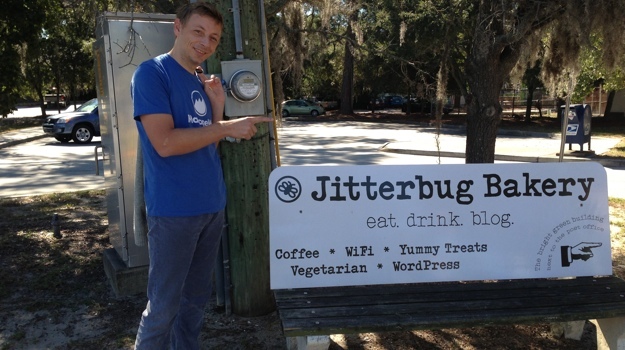 The Jitterbug Bakery played a crucial role in our WordPress meetings (and our bellies) throughout the WordPress Community Summit. We enjoyed some great snacks and drinks here. I can say that the most interesting thing about WordPress Community Summit was that it was mostly unscripted. 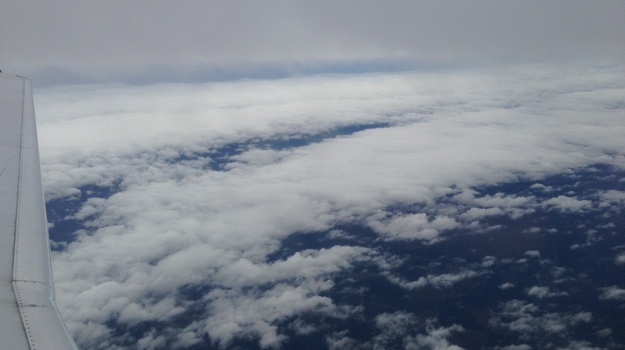 The unconference style, which was a new experience for me, was fascinating. There were so many ideas being exchanged, and the result was action. 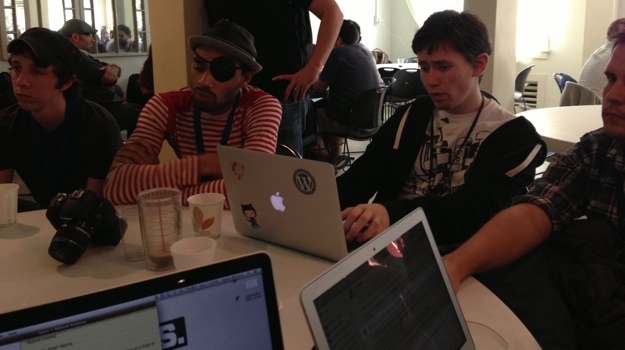 Overall, WordPress Community Summit 2012 was an engaging and exciting experience. It was great to see so many great minds huddled into a building, with each person contributing something back to the WordPress community. And I can’t forget to mention that we stood near the area, in Savannah, where Tom Hanks was filmed at for Forrest Gump. How cool is that? Not even a week later and I’m on a flight to Phoenix to make my way to Chandler, Arizona. I was invited to PressNomics 2012, and I can’t thank Joshua Strebel quite enough for allowing me to attend. PressNomics was, without question, the best conference I’ve ever attended. I know that’s a bold claim, but it’s one I won’t hesitate to stand by. 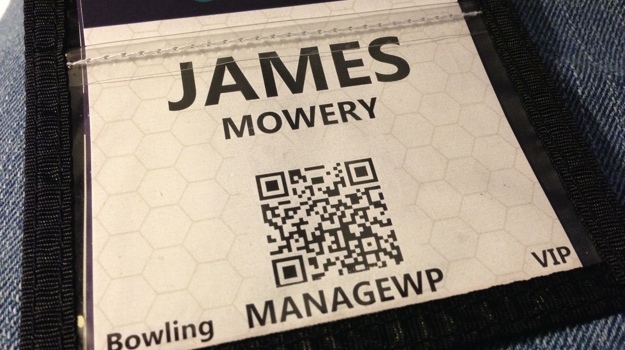 There was so much to do, so much to learn, and so many amazing people to talk to at PressNomics. It was great because there was a great balance of amazing content provided by the speakers — many of whom spoke about the economics of WordPress and successfully running a business within this ecosystem — and opportunity to network and talk with existing friends, all while making new ones along the way. Here’s my badge. You might notice that mine says “VIP”. Apart from the obvious fact that I am, of course, VIP material (I’m kidding… or am I? ), this little designation had more meaning than I initially thought. But more on that later. 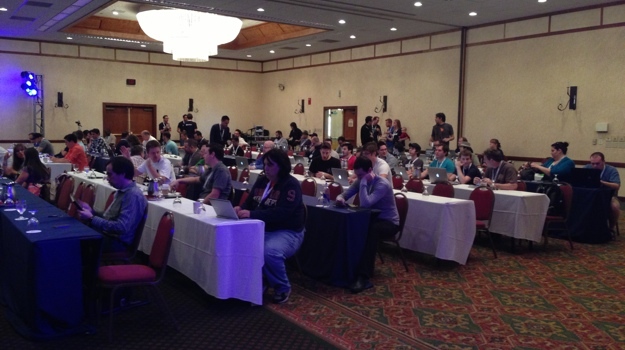 Here’s where the core discussions at PressNomics took place. We were located in the ballroom at Crowne Plaza San Marcos Golf Resort. This room was, at times, filled with 150+ people. And this is where an impressive amount of knowledge was soaked in by many of us in attendance. Remember that “VIP” designation? Well this is the US Airways Center, the home of the NBA’s Phoenix Suns, and this was what we were up to last Friday night. 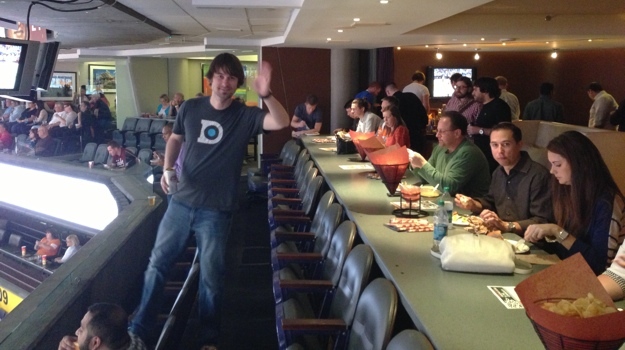 We got to enjoy a whole private room at the arena, along with all the drinks we wanted. 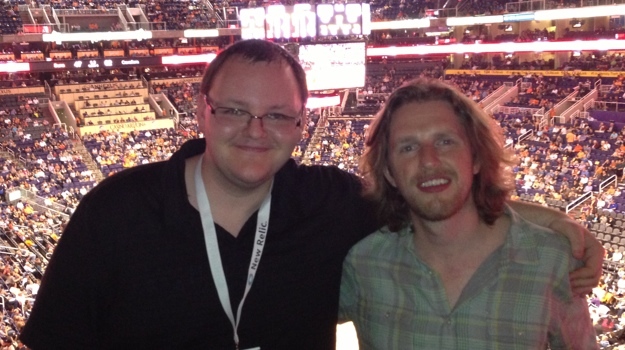 Matt Mullenweg also joined in on the fun! And we got to enjoy the game with an incredible view of the action. And then there’s Joshua Strebel, the man behind PressNomics 2012. Both Sally and Joshua Strebel deserve all the credit in the world for putting on an amazing and unforgettable experience. They were amazing hosts, and they were a lot of fun to be around. My big takeaway from PressNomics 2012 is that a large event doesn’t have to be tied to the WordCamp name in order to bring people together. Of course, it’s great that WordCamp profits go to the WordPress Foundation, but there is also opportunity elsewhere. For example, profits from PressNomics are going to St. Jude Children’s Research Hospital, which is a very noble thing, indeed. And the entire team behind PressNomics did one heck of a job putting the whole thing together. The presentation was astounding, the people were great, the knowledge I gained was invaluable, and the experiences I had were unforgettable. And, to top it off, it was fun! In closing, I hope WordPress Community Summit and PressNomics 2013 will be as great, or even more so, as they have been for 2012. Both these events have a very bright future, along with the people behind them, and I can’t wait to see what they have in store for 2013. Thanks again to everyone behind these events, to everyone who attended, and to everyone who I had an opportunity to meet. All of you are amazing!